Deepest intercostal muscles situated within the intercostal spaces are the Innermost intercostal muscles. Together with the internal intercostal muscles they constrict at the time of expiration in order to minimize the transverse area of the thoracic cavity. Just above the costal groove, the innermost intercostal muscle emerges from the internal surface of the rib, and is inserted within the upper border of the rib below. Its degree is alterable. Generally it spreads more posteriorly compared to the internal intercostal and like the external intercostal not very distant anteriorly. Only the presence of the intercostal nerve as well as vessels among them distinguishes the innermost intercostal by the internal intercostal. The fibers of the innermost intercostal and the internal intercostals have similar alignment. Within the lateral thoracic wall these muscles are the most prominent. They range from the medial edge of the costal groove towards the deep surface of the rib below amongst the inner surfaces of neighboring ribs. 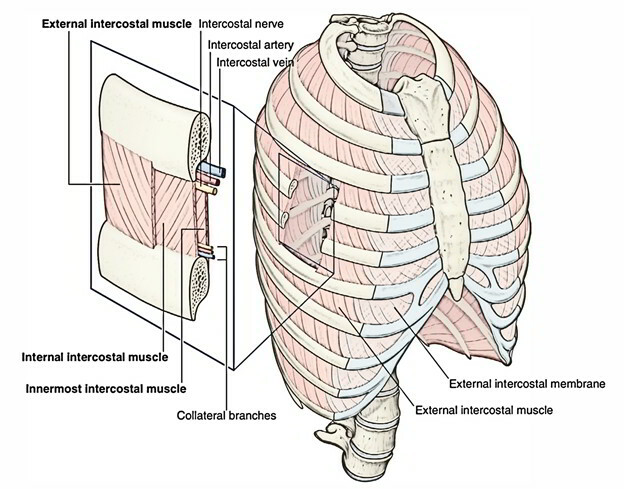 At a plane amongst the innermost as well as internal intercostal muscles, the neurovascular bundles connected with the intercostal spaces move nearby the thoracic wall within the costal grooves. Anterior and posterior intercostal arteries supply the innermost intercostal muscles, while internal thoracic vein and intercostal veins provide drainage. Correspondent intercostal nerves supply the intercostal muscles. The intercostal nerves travel within the middle and innermost layers of muscles. They are organized in the following order from above to downward – intercostal vein, intercostal artery, and intercostal nerve.